Interactive online map of gold production. World map of gold resources yield for 2016 exercise. 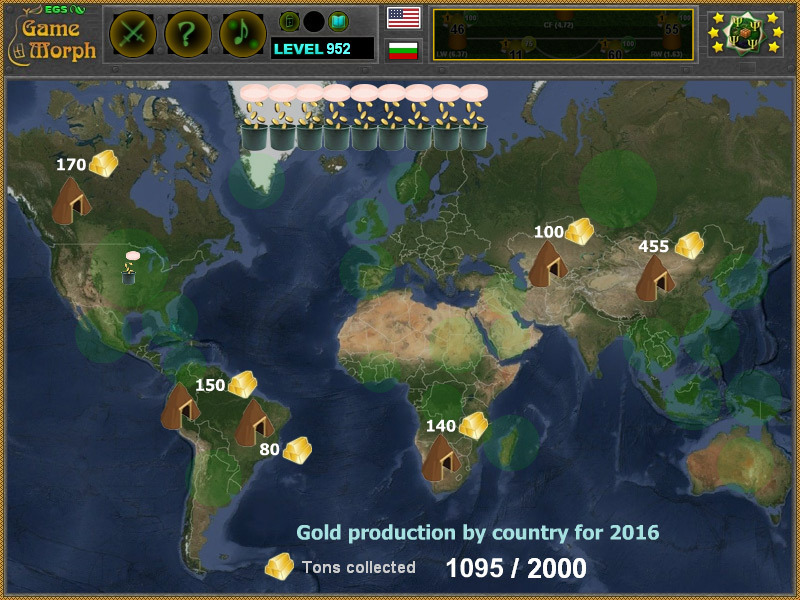 "World Gold Production" is a free online knowledge level game to find which country produce the most metric tons of gold for 2016. Interactive world map of gold production. Click on a region on the map to dig for gold, and collect 2000 metric tons. A small educational game for desktop computers, laptops and tablets, which may be played in the web browser. The Geography Knowledge Board include world map and 34 hidden places to play with. The game is part of the Interactive World Maps educational tools. Which country produce most gold metal resource? How many metric tons of gold are produced per year? What are gold yield rates for 2016? Where to dig for gold? What is the production of gold per year of USA? How to play World Gold Production. Here is the map of the world and 20 sieves on the top right of the screen. Click on the locations of the map to see how much tons of gold that region produce per year. The ammount of the gold production will be added in the bottom counter and one sieve will be lost. The purpose is to collect 2000 metric tons of gold per year, before you run out of sieves. The amount and locations are approximate and some regions will yield 0 gold to make the exercise more difficult. The exact amounts of gold production by country are in the "class subject" section. Know the 4 countries that produce the most gold in 2016 and get +1 Knowledge Level. Class subject: World gold production by country. Gold is the most malleable of all metals - a single gram can be beaten into a sheet of 1 square meter, and an avoirdupois ounce into 300 square feet. Gold's atomic number of 79 makes it one of the higher atomic number elements that occur naturally. Traditionally, gold is thought to have formed by the R-process in supernova nucleosynthesis,but a relatively recent paper suggests that gold and other elements heavier than iron may also be produced in quantity by the collision of neutron stars. The following is a List of countries by gold production for 2016 from Wikipedia.